Inspection of Troops at Cumberland Landing. At Cumberland Landing, one of the most magnificent spectacles ever seen in the army was presented, when the combined forces, massed upon the bank of the river, converted to the barren fields, as if by magic, into an immense city of tents. From the hill above Toller’s house the scene was truly grand. Division after division, closely compacted, they stretched away, until, in the distance, the white tents were mere specks against the dark frame of woods. On one side the slow Pamunkey, like a mirror, reflected the immense fleet of transports, with their convoy of gunboats. Winding among the tents, long strings of animals were continually passing to drink of its brackish waters. Along the shore piers formed of barges, side by side, were thronged by commissaries and their assistants, while strong arms rapidly discharged the cargoes of meat and bread into the waiting wagons. Prominent in the picture was the camp of General McClellan’s headquarters, which had just narrowly escaped capture, through taking a wrong direction. Another striking object was the park of the pontoon boats dawn through the bottomless roads of the lower peninsula, with so much labor. Our picture, interesting as it is, gives but a small portion of the gorgeous whole. The prominent object is a mud-bespattered forge, the knapsacks and blankets of the farriers carelessly thrown on the ground beneath. 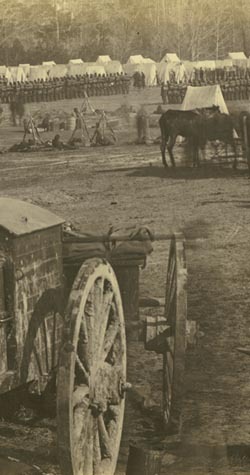 In the middle-ground are some mules picketed around the wagons, hard-working, much-abused creatures, and so humorous in their antics that they were often termed the comedians of the army. Further on, a guard, their muskets stacked and knapsacks laying around. Past these, a cook sitting on a mess chest, close to the ashes of his fire, near which are the camp-kettles and a pile of firewood. On the edge of the wood the Fifth New York Volunteers, Warren’s Zouaves, have encamped, and in front of them a regiment of infantry are drawn up in column of companies. As these are formed in open order, it is most likely that they are on inspection drill. Such pictures carry one into the very life of camp, and are particularly interesting now that the life has almost passed away.